If you're looking for a starring act for your meeting or celebration, check out the Owsley Brown II Portable Planetarium. Kids and adults alike are captivated by the exciting, engaging shows that take them on a journey through space. You can opt for one (or both) of the shows below or work with us to customize a program that meets your particular needs. 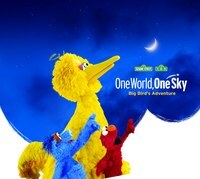 Explore the night sky with your favorite friends from Sesame Streetin One World, One Sky: Big Bird's Adventure. Follow along with Big Bird, Elmo and their friend from China, Hu Hu Zhu, as they take you on a journey of discovery to learn about the Big Dipper, the North Star, the Sun and the Moon. Let us take you on a dizzying tour of the universe on our virtual space ship. This flight through time and space takes you from the edge of the universe to our tiny little block on Earth. This awe-inspiring journey is sure to be a crowd pleaser!